Xiaomi has created a lot of buzz in the industry since its establishment in 2010 and is well known for selling budget products ranging from smartphones, smart TVs, air purifiers, smartbands, electric scooters and many others. 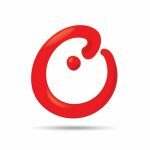 However Xiaomi prefers to think of itself as a services and software company, rather than a hardware player. However, Xiaomi is recently suffering from stagnating growth due to weak Chinese demand and Xiaomi’s difficulty in establishing overseas market entry. As a consequence, its smartphone shipments in 2015 did not reach the original target of 80 million. Xiaomi is trying to address this issue through quickening the product release cycle and broadening its supplier base to include new hardware vendors such as Qualcomm. The Redmi Note 3 was first launched in November 2015 based on a MediaTek application processor (AP). It was considered good enough in performance terms and was aggressively priced at 899 RMB (around $140). It has now been upgraded with a Qualcomm Snapdragon 650 processor, better camera, SD card support, and some other modifications. The price has been upped by 100 RMB from its previous 899 RMB. In some markets the Qualcomm version is called the Redmi Note 3 Pro while the original version is now referred to as the Redmi Note 3 (MediaTek). Potentially confusing to regular consumers. Redmi Note 3 has two versions depending on RAM. 3GB model comes with 32GB of internal storage and 2GB model comes with 16GB of internal memory. Additionally, it supports external memory up to 128GB and the SD card slot is shared with SIM2 slot. Most importantly, Redmi Note 3 uses Snapdragon 650 renamed from Snapdragon 618 by Qualcomm and shows great performance enhancement over the previous version. Redmi Note 3 is available in gold, silver, and dark gray, and has the fingerprint sensor on the back. Metal-effect plastic bands are used at the back’s top and bottom – presumably to enhance antenna response for both wide area and local area radios, and GPS. 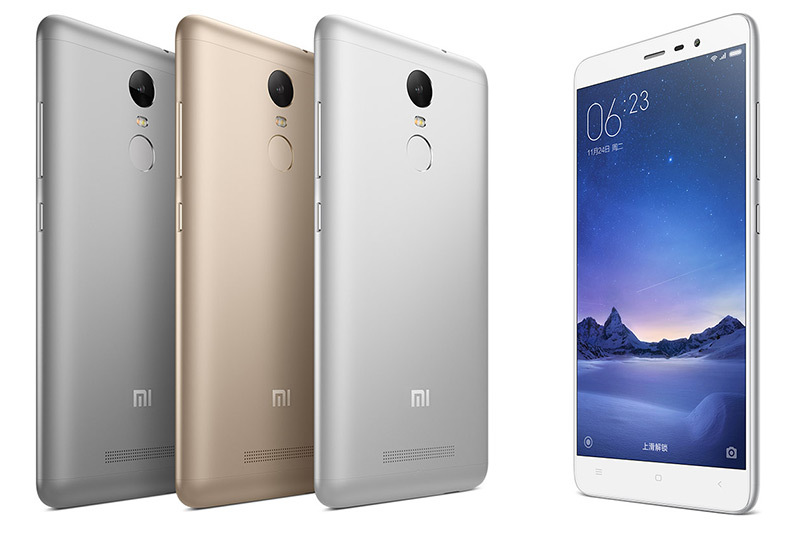 Redmi Note 3 features 5.5 inch FHD IPS display. While top end phablets support QHD displays, the Redmi Note 3’s FHD is adequate and loses little in terms of the visual efficiency and benefits from lower power consumption. 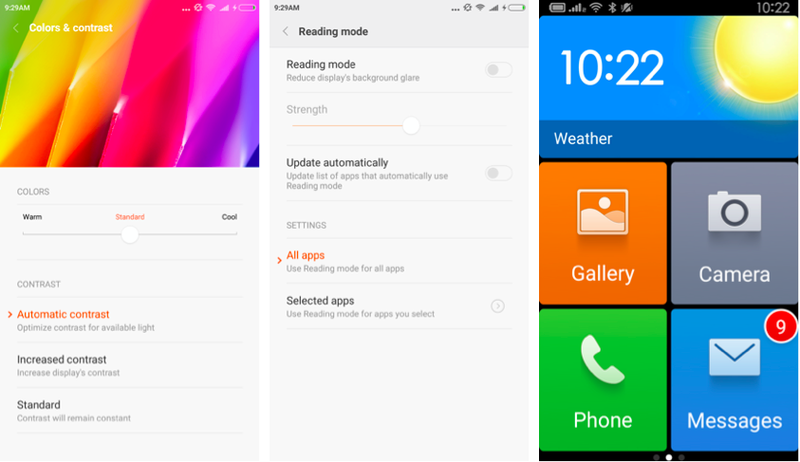 MIUI7 contains automatic contrast feature, which helps to see the display in varying light conditions optimizing the contrast for the prevailing light conditions. You can choose the color temperature among warm, standard, and cool. 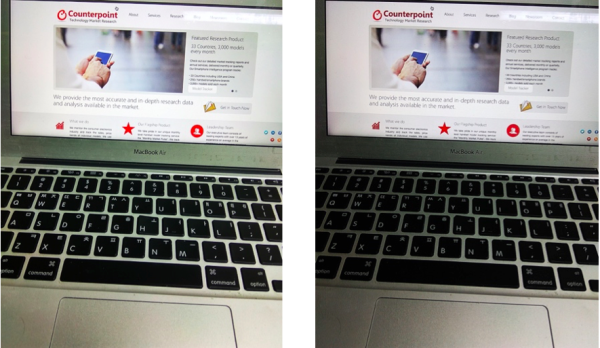 In addition, reading mode can make viewer’s eyes less tired by reducing the display’s background glare. Lite mode can be useful to those hard to recognize small characters on the screen. Redmi Note 3 Pro is the first smartphone to use Qualcomm’s Snapdragon 650 as the AP. The Snapdragon 650’s CPU architecture consists of dual Cortex A-72 and quad Cortex A-53. The Cortex A-72 seems to give Snapdragon 650 great performance enhancement over its predecessors such as 615 and 616. 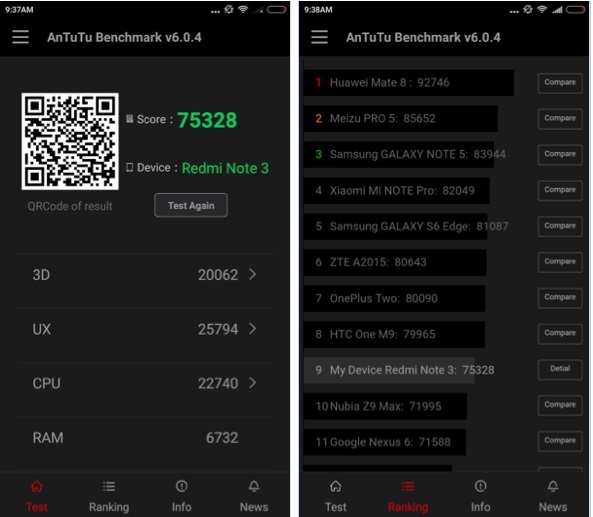 According to Antutu Benchmark, the score is over 75000 and the ranking is a bit higher than Motorola’s Nexus 6 and LG’s G4. They use Snapdragon 805 and 808 respectively, and the score indicates that the performance of Redmi Note 3 is similar to those premium phones. 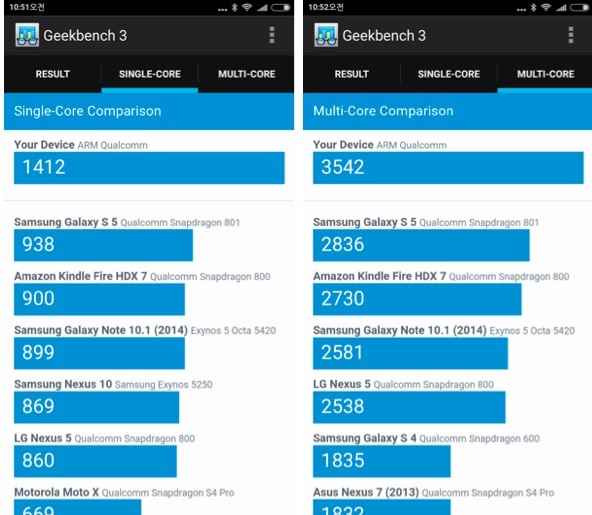 Geekbench also shows good scores, but multi-core performance is not so impressive as single-core score as it is lower than the MediaTek version. This is likely due to the Snapdragon 650’s hexa-core architecture compared to the MediaTek Helio X10’s octa-core. Redmi Notes 3’s rear camera was upgraded with 16 million pixels and f/2.0 over 13 million pixels and f/2.2 from the MediaTek version. It supports phase-detection AF (Auto Focusing), enabling fast and accurate focus. If you slide to the right at the viewfinder, you can select camera modes such as Panorama, Timer, Manual, Gradient, Beauty, HHT, Scene mode, Tilt-shift, and Fish eye. Manual mode enables you to adjust white balance and ISO, and Beauty mode is useful when you take selfie for SNS such as Facebook. Tilt-shift and Fish eye mode can make your picture more interesting. Twelve filters can be selected when you slide to the left. In Camera settings, there are useful options such as gridlines – useful for composition. Also, you can turn Age & Gender option on, showing your age and gender guessed by Redmi Note 3 when you take selfie. It is very funny and tells you how you can look younger than now. Redmi Note 3 camera supports HDR (High Dynamic Range) imaging. HDR can get images with higher contrast by taking the same picture several times with various exposure and then composing with HDR algorithms. The front camera is same with the MediaTek version with respect to image resolution, but video resolution was enhanced to 1920×1080 pixels from 1280×720 pixels. Redmi Note 3 runs on MIUI 7 based on Android 5.1.1 Lollipop. MIUI 7 feels a bit heavy, but offers convenient options. You can open Task Switcher by pressing the left soft key and apps will be locked after you slide the app icons to the bottom. The locked app will not be shut down even if you select Clear All option by pressing X icon at the bottom. A lot of themes can be downloaded from the Mi store just by tapping the Themes icon on the homescreen. Once you create a Mi account, downloading and applying a new theme is very easy and intuitive. The Themes store helps you to choose your favorite themes by providing Top Charts, Categories, Wallpaper, and Downloaded buttons. You can enter One-Handed mode if you swipe on the soft key in either direction and choose among 4.5 inches, 4.0 inches, and 3.5 inches depending on your hand size. Child mode, added from MIUI 7, prevents your kids from making accidents by assigning apps that can be run. Xiaomi’s Redmi Note 3 Pro, powered by Qualcomm Snapdragon 650, shows almost the same performance as some flagship models. It features metal body, large display size, enhanced camera components, 4000mAh high-capacity battery, and MIUI 7’s convenience with the affordable price of around $200. As of 17th Feb., global ROM for Redmi Note 3 is not officially released, so you have to sideload Google Play Store yourself if your reseller did not do it for you. Apart from this inconvenience, Redmi Note 3 is currently one of the best smartphones for under $300. If Redmi Note 3 Pro is released globally in the near future, it is likely to contribute to Xiaomi’s market share expansion.